It's so hard to snack healthy these days: Everything is loaded with sugar, fructose corn syrup, or dairy! The worst part is that sugar is a huge beauty betrayer, in the sense it contributes to blemishes, age spots, wrinkles, cellulite, and lackluster skin (every 20-somethings nightmare). Luckily, I found a pretty neat recipe while cruising through Instagram that I enhanced and tweaked to make it my own. It's completely vegan, no bake, and doesn't require more than 2 hours to make, max. This recipe should produce at least 12 bites, assuming you're using a similar mold to my own. It only required 6 ingredients to make, all of which I readily found in my kitchen. The original recipe called for raspberry filling (which sounded equally yummy), but since I didn't have any raspberries, I decided to go with cranberries. It's probably for the better too: Cranberries are currently in season and are loaded with anti-aging power that reduce wrinkle-causing inflammation. Cacao (when not loaded with dairy and sugar) also blocks wrinkle formation and is a real treat for your complexion. In other words, this snack will actually make you look younger and prettier. Ready to dig in? Me too. For the cranberry filling, add the cranberries to a pot on medium heat. Let them simmer and become mushy, mixing them around with a wooden spoon every so often. Turn off the heat when they start to get very soft and juicy to avoid burning them. Add the maple syrup and vanilla extract to the pot and mix well until completely blended with the cranberries. It should resemble cranberry sauce in appearance. In a separate pot or pan, add the coconut oil. Allow to completely melt on low to medium heat, then add the cacao powder, maple syrup, and a pinch of salt. Mix well. When all ingredients are properly blended together, remove from heat. 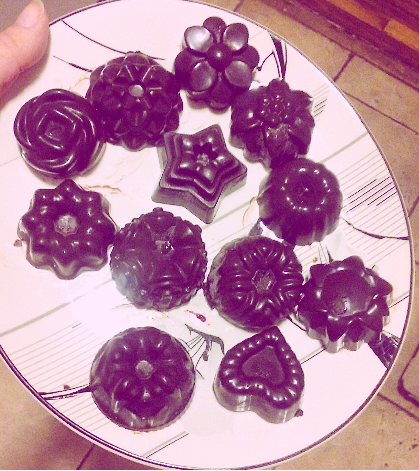 Pour the chocolate mixture into silicon mold (I got mine here) - but don't fill the mold all the way. Fill them about 1/3 of the way, to leave room for the other layers. Place the mold in the freezer for 15 minutes. This will settle the chocolate. Take the mold out and add the cranberry filling in the middle so that it fills up about 2/3 of the way. Afterwards, fill up all the mold with the remaining melted chocolate. If you would like, you can wrap the top of the mold in plastic wrap to help prevent it from spilling, but this is't necessary. Place your mold back in the freezer, but this time leave it in for an hour. 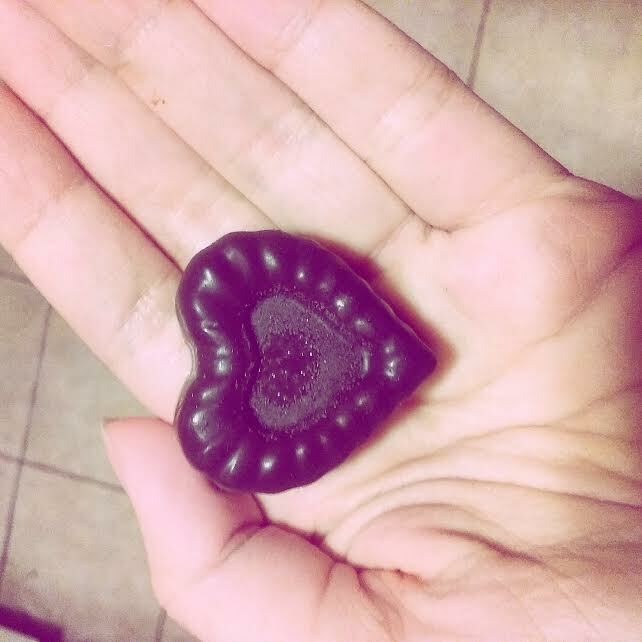 When the hour is up, simply pop the vegan chocolate cranberry bites out of their molds and enjoy!